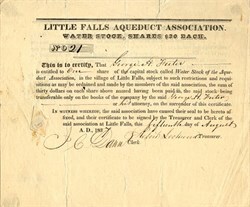 Beautiful certificate from the Little Falls Aqueduct Association issued in 1837. This item has the signatures of the Company's Treasurer, Robert Sockman and Clerk, I. C. Dann and is over 171 years old. In 1806 the Aqueduct Association was formed to build a water supply system from springs to local subscribers by means of pump logs. 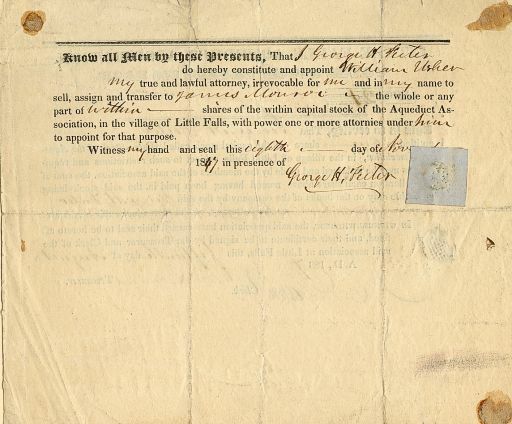 Paper money was printed and the laborers were paid in this script, which was redeemable at the Ellice store. This was the first type of banking in Little Falls, New York. The Little Falls Aqueduct remained in service until 1881.